We are able to transfer most types of analogue audio tape from mono 1/4" right up to 24 track 2" on reels up to 12" diameter. We have six transfer stations available and multiple machines for common studio formats, so we can accommodate large volume archive customers efficiently. 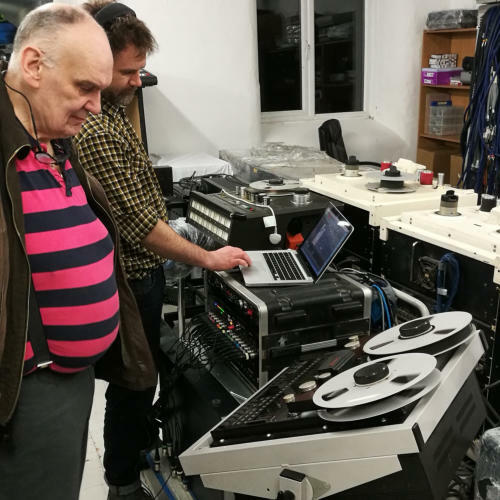 All our 1/4" and 1/2" Mono and Stereo machines are either Studer or Otari and we have three Otari MTR-90's for the 2" 24 track tapes to get the very best out of professional studio recordings. All our machines are regually serviced and calibrated and we are fastidious about getting every last bit of audio quality out of all of them. We also have access to studios with extremely rare machines which can be used if neccessary. Before your tape is transferred, it's condition is assessed, and then is cleaned and baked as is deemed appropriate.